Creating visual content that grabs people by the eyeballs doesn’t require a degree in design as long as you have the right tools. You need to create great visuals in order to hook your audience by their eyeballs and draw them into your content. Their brains will connect with your image 60,000 times faster than your brilliantly crafted headline. So how can you create these beautiful, eyeball grabbing images without spending a fortune? Well I’ve come up with a small list of the best desktop tools to create visual content. This is part of my Essential Guide to Sharing Images Online series. Be sure to catch the rest of the series as well! All of the following apps have been tested to the max by myself and some of my audience, clients and friends. If an app or software did not make it into this mix it’s either because it did not pass my quality standards or I flat out wasn’t able to research it. The apps in this category are web apps. This means that you can only access them through your internet browser and cannot be accessed offline. My number one recommendation to anyone looking to create visual content in a quick, easy, and free way is Canva. It is easy to use, has a boat load of professional grade templates and the people behind it are pretty darned cool. You can watch my interview with founder Melanie Perkins on the official dustinstout.com YouTube channel. Canva greets you with a number of options for your canvas based on what you are going to create. From a general social media image to a Podcast cover, presentation, blog graphic, social media covers, and more. Once you pick your canvas size, it’s off to the editor where you can add color effects, text, crop, and add all sorts of things to create the perfect visual. You can use all of Canva’s features completely free of charge. There is also a large database of free stock images and designer templates that you can use in your designs. However, some of the design templates and stock imagery have a price. Once you’re finished, Canva then makes it easy to save to your computer or share it straight out to Twitter or Facebook. 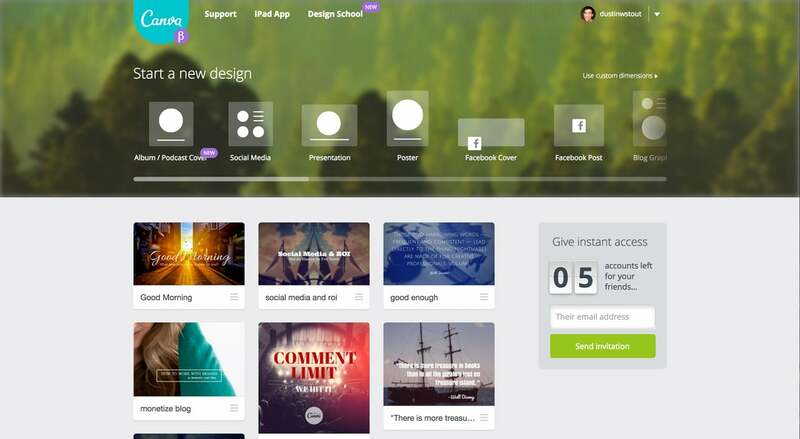 If that’s not enough, Canva is doing some really amazing things in the realm of design education. Their newly launched Design School is a great way to learn design at your own pace. This is a great way to sharpen your visual content creation skills. PicMonkey is very similar to Canva in that it’s free to use, has a large number of templates, images, and graphic design features that are either free or paid. The difference is PicMonkey offers a monthly subscription plan to unlock the premium features whereas you only pay for each premium item you want with Canva. I’ve also found that the user interface is a bit clunkier with PicMonkey and it took me longer to get used to than Canva. This may be due to my personal style though, so do give it a try and see if the workflow vibes with you. Once you’re done with your image on PicMonkey, you also have the ability to share it to your social networks (more options that Canva), which is quite convenient. 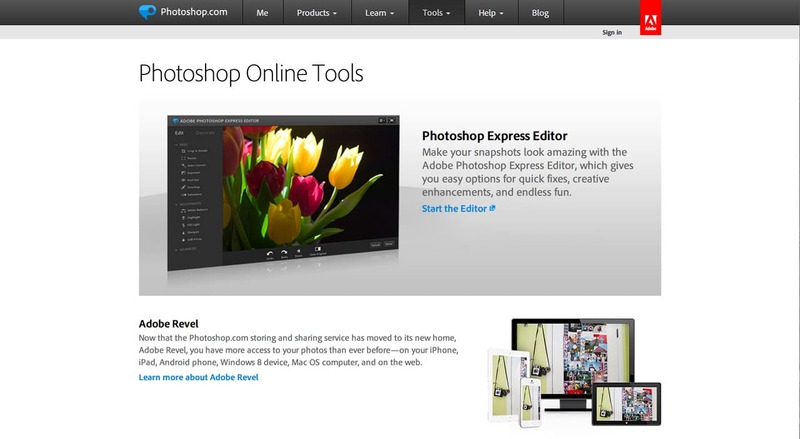 Adobe, in all their generosity, have made a free version of Photoshop available to all called Photoshop Express. In it you have many of the professional grade features that professional graphic designers use on a daily basis. In all honesty, most people could get by using only this software for basic graphic design and visual content creation. Although it doesn’t offer a lot of the power that the full version of Photoshop has (such as working with layers), it’s still quite powerful. What makes it different from Canva and PicMonkey is that it doesn’t have any sort of marketplace where you have access to designer templates and stock images. You will have to find all that on your own and upload it into Photoshop Express. Pixlr Editor is very much like Photoshop Express but far less features and a tad more clunky on the user interface. However I have been told that it’s pretty intuitive if you’ve never worked with Photoshop before. What it definitely has over the previous options is that it’s the first (and only) web app that allows you to work with layers in a similar fashion as with Photoshop. This comes in handy when you are working with a lot of different elements and want to select one of them quickly without disturbing the other elements. These apps are available for download so that you can use them offline. Gimp is probably one of the oldest free graphic design softwares out there. It is very similar to Photoshop and for anyone who has experience with Photoshop, it’s a rather easy transition. 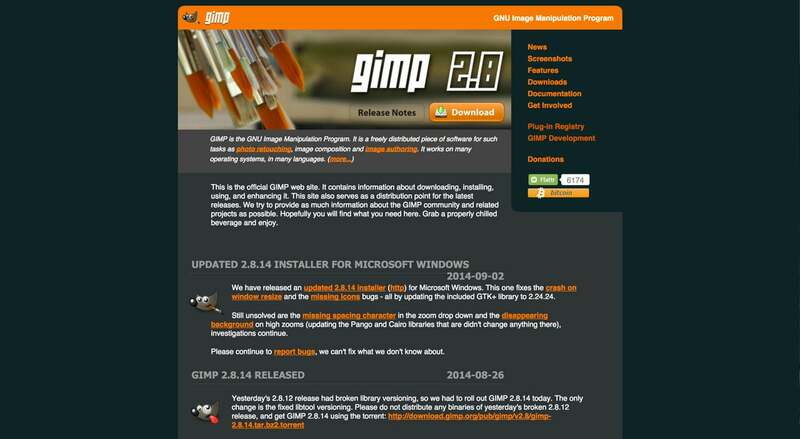 Gimp works with pretty much any operating system and has a wide variety of features. It’s also got extensive documentation and guides. Being that it’s been around for a while also means that there’s probably more than enough tutorials and tips written about it to help you shorten your learning curve. 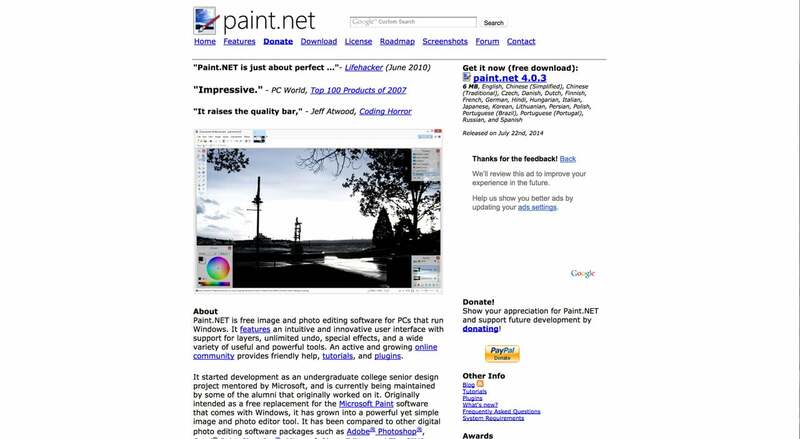 Although I’m not too fond of Paint.Net myself (it feels like it was built in 1990 and never got updated), many people have found it’s minimal toolset and ease of use to be very helpful. You’re able to work with a variety of image formats and has a similar feel and function to Pixlr Editor and Gimp. I know of a few people who do graphic design work professionally that use it on a regular basis. Now if you want to get a professional grade editing software and don’t mid paying a small premium (compared to Photoshop), my two recommendations are Sketch and Pixelmator (Mac only). If you’re wanting to get into serious graphic design power and don’t want to spend more than $30, boy are you in luck! 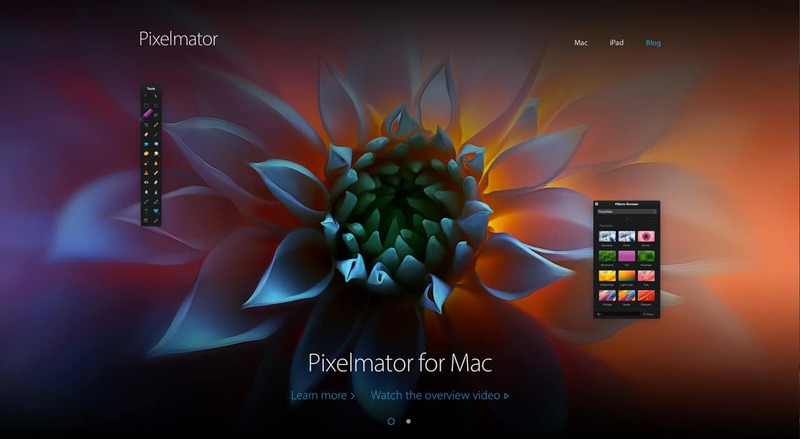 Pixelmator packs a ton of power for a very small price. There’s not much that you can’t do with Pixelmator. It also has a companion iPad app that could come in handy if you create visual content on the go. 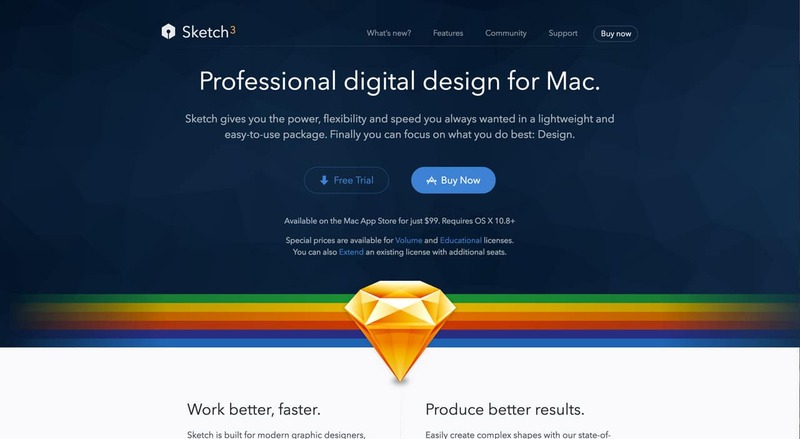 Sketch is gaining a lot of ground with web designers and user interface designers. It has a very powerful set of features for designing complex projects. It is all vector based and employs cutting edge workflow to make the process of designing super efficient. Now it’s time for you to go test out some of these tools and see which one fits. Not everyone will take to the same types of workflows or features. Find the one that works for you and use it regularly. The more comfortable you get with the tools you use, the better your visual content will get. Are there any apps or software you would add to the list? Have a question about how to use a specific piece? Let me know in the comments below— I’m always listening. 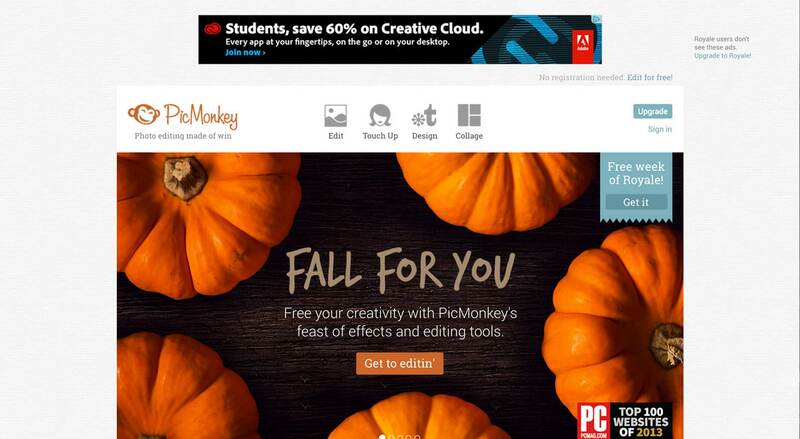 Awesome list of desktop visual content tools! Love using Canva for presentations or PDF documents. They really have come a long way, haven’t they? For social media graphics, I use Stencil. It’s a lot easier and faster for me. You should give them a try: getstencil.com. I’ve heard of Stencil–a friend of mine, Donna Moritz–really raves about them. This has been getting some buzz. Apple seems to like them. I haven’t used any of the Affinity products yet. They do look interesting. Hi Dustin! Your article is very useful, but I’ve noticed that you didn’t include Bannersnack. Have you tried it? I think that you would find some very interesting features that are unique in this field. Its nice and easy to use .. Thanks putting this list together. 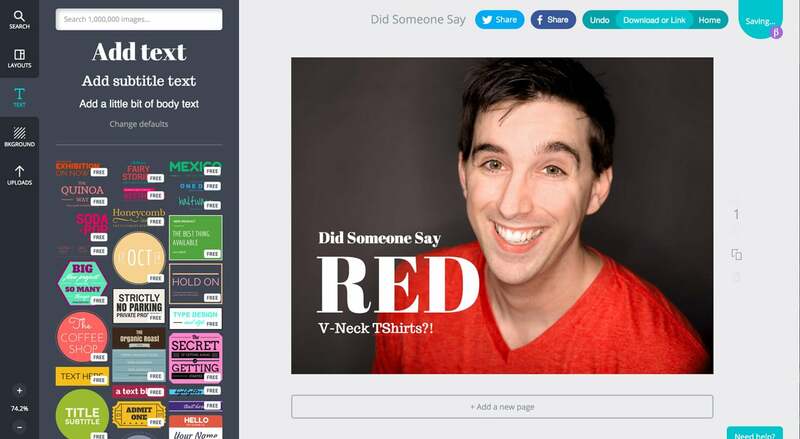 I’ve been using the beta of http://www.postful.ly and love it. They have really gorgeous layouts and beautiful images. It’s by the same team that created Spoken.ly. I’ll have to check that out too! Thanks Tina! Have you tried Ribbet? 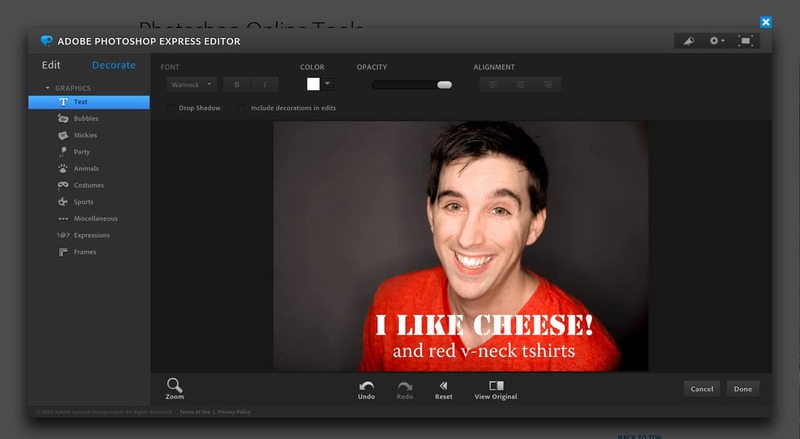 I absolutely love it as the premium features are all free to everyone – something over and above what PicMonkey offers. All my visuals on my blog are done on either Ribbet or Canva. Thanks for sharing some other names. Nice article. Glad you liked it Ahmad! I’ll have to go take a look at Ribbet. Yes, I like using Canva and PicMonkey, and like the ability to upload images or elements to use in these online tools. It makes for a quick solution, and I don’t have to hunt around in my computer(s) image library for the stuff I want to use. As PicMonkey also has the ability to use the fonts on your machine, this helps extend its usefulness – many of the other online tools restrict you to the fonts that they provide. I also use Pagemodo – it has a posts design option – but it seems to act strangely sometimes, and will also add branding. You can get round that by downloading the image and cutting off the branded text, but as Canva has more options and doesn’t add text, I think Canva is better if you are looking for an online template solution. I love that there are options out there, and these are particularly useful if you are “on the go”, or want to do something quickly. When using Photoshop, I tend to mess around with things more, which might end up with a better output (usually), but takes longer. Thanks for adding to the conversation Lia! Yes, I know what you mean by spending too much time in Photoshop. That’s why I try to do a lot through the mobile apps I’ve listed— super efficient for on-the-fly work. I love Canva. 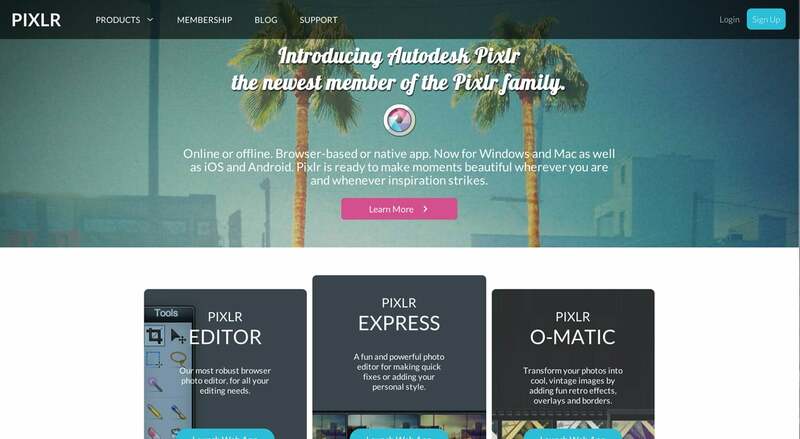 I found it only recently and have been using it to make all the graphics for my blog and social media.This is a great list, I’ll definitely try Pixlr Editor (layers!) Thanks for sharing. Awesome Shivani! Let me know how you like Pixlr! It’s very different from Canva but has a lot of unique advantages. Excellent review of the best. My colleagues all love Canva. I’m an old Photoshopper so I still use it, couldn’t see investing the time into learning Canva. PicMonkey is good, I have used it when Photoshop wasn’t available, like on other computers. I want to try Sketch. I’d love to be doing vector art, and I hate Illustrator. Thanks for the tip! I see there are free downloads available … any recommendations for which one to get? Are they all the same? 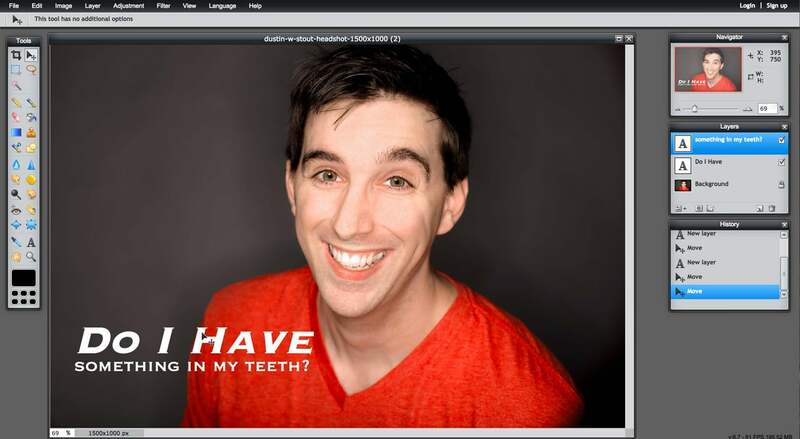 Honestly, if you have Photoshop and are comfortable using it– you don’t need anything else. Aside from the benefits of having the designer templates that Canva offers, there’s nothing else that the other options give that you can’t do with Photoshop yourself. The only exception of course is working in vector, but Sketch has a price. I’ve tried it but couldn’t get it to give me a downloadable version of what I created. Seems really buggy. 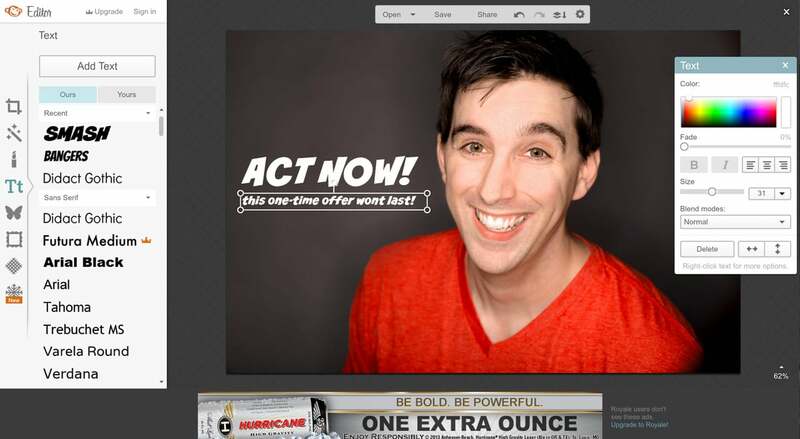 Dustin, I do use the ‘quick & dirty’ apps – Canva and iPiccy in particular for quick easy jobs. But I couldn’t ever envisage doing tricky graphics work on an iPad? I have to use my laptop. Am I the odd one out in this? I find mobile devices better for different things. For quick and easy, light edits I really like the touch interface of mobile devices. It’s really enjoyable to be able to feel so connected to what you edit. I also love the ability to edit an image I take instantly and not need to wait to get home. However, if I need to do precise editing, then a touch device usually doesn’t cut it. Many apps lack the power tools you need and it can be easier to do those tiny adjustments with a mouse or arrow keys on a keyboard. That’s me personally, but I can understand why other people wouldn’t feel that way. Yes! There is something awesome about using your fingers to edit an image right after you take it on your device. Selection, have you tried out pixelmator on the iPad yet? It now ps touch out of the water for making graphics and with handoff to the desktop you can easily switch between devices. Pretty cool.